Whenever we need to show someone something on our smartphone or tablet, or if you write tech-related articles like us, then knowing how to make screenshots is an absolute must. Taking screenshots on an iOS device has always been a pretty straightforward process, but in the past, making Android screenshots used to be a convoluted and difficult affair. Thankfully, Google has integrated the screenshot feature from Android 4.0 (IceCream Sandwich) onwards, making it much easier to do. All it takes to make a screenshot is to press a few buttons. The following steps is the default method. Press and hold down the power button and the volume-down key simultaneously. Do not release the keys until you hear the shutter sound or see your screen flash. The screenshot will now be in your phone’s gallery. Many manufacturers integrate their devices with another method to take a screenshot. Here is how you can take a screenshot on your smartphone if it does not support the default mode. Press and hold the power button and the home button simultaneously. Keep pressing the keys until you hear the shutter sound or see your screen flash. This method of taking screenshots is the default for most Samsung devices running Android 4.2 and above. This includes Galaxy S3, Galaxy S4, Galaxy S5, Galaxy S6, Galaxy S7, and many more. Press and hold the power button and home buttons together. Many Android devices come integrated with other methods of taking a screenshot, but Samsung believes in taking cue from various iOS functionalities (Apple takes inspiration from Samsung too). That is why it uses Home Button for capturing screenshots. For example – the Samsung Galaxy S6 allows users to take a screenshot through a palm swipe gesture, where users just need to swipe their hand over the phone’s screen. The Palm just needs to slide slightly above the display without touching the screen. 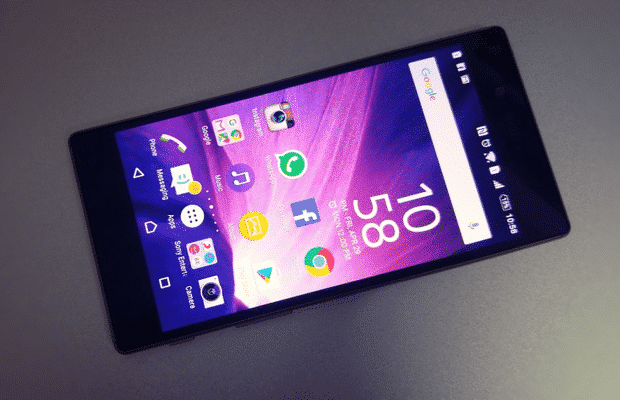 With the help of a sensor, the phone is able to take screenshots. This method will work on Samsung Galaxy S5, Galaxy S6, Galaxy S7, Galaxy Note 4, and Galaxy Note 5. 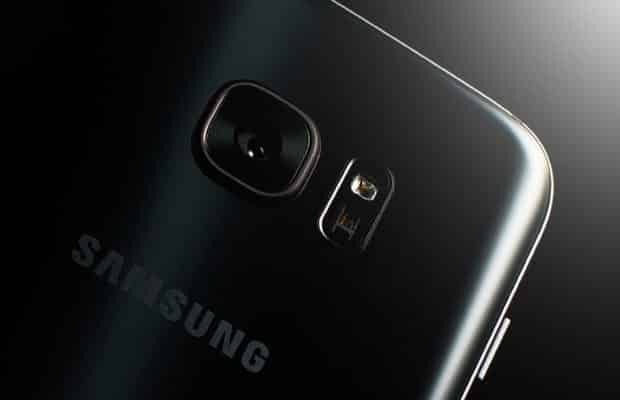 Go to your Samsung Galaxy phone’s settings. Tap on Motions & Gestures. 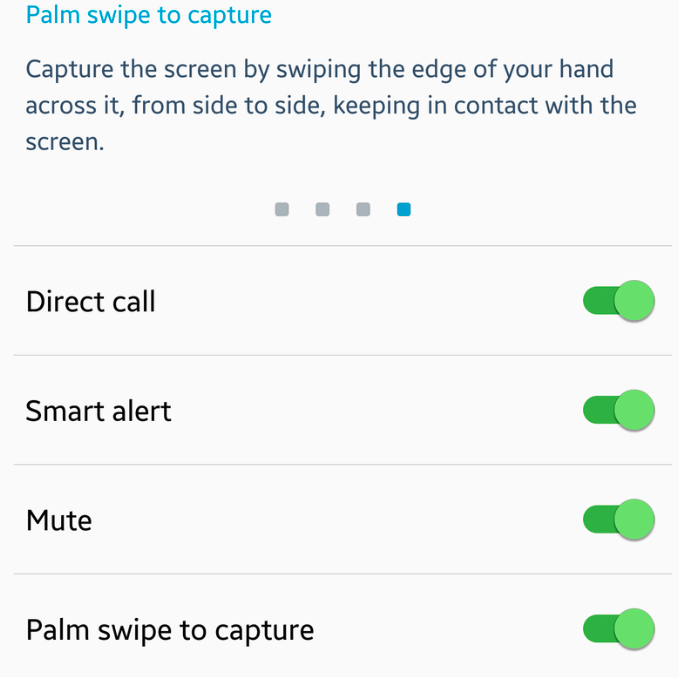 Enable the “Palm swipe to capture” option. Test the gesture by slowly moving your palm over your phone’s screen. Keep trying until you hear the capture sound or see your screen flash. This method will work on most of the phones such as HTC One M8, HTC 10, Nexus 5X, Nexus 6P, LG G4, LG G5, LG V10, Sony Xperia Z5, Xperia M, and many more. Press and hold the power button and the volume-down key simultaneously. Select the option and crop the area for your screenshot. 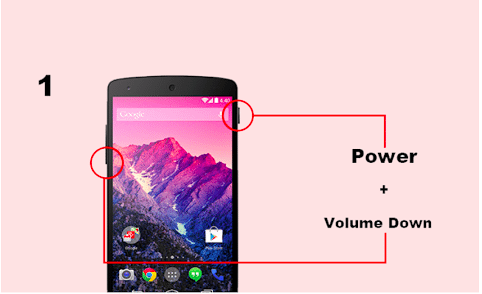 If your Android device does not support the Volume-Down Button + Power Button method then you must try the other combination – Power Button + Home Button. These are the most popular methods that are used by most of the manufacturers. There are also a couple of good third-party apps for taking screenshots. The Screenshot App is number one on the Google Play store in its category. It is a dedicated app for taking screenshots with a user rating of 4.5/5. One of the highlights about the app is that it lets users trim and edit the screenshot. Your device must be running Android 4.3 version or above to install this app. Another third-party Android app for taking screenshots is Screenshot Easy. This app allows users to choose the desired method for taking a screenshot. The user can make a choice between two combinations – the Power Button + Home Button or the Power Button + Volume-Down key. This app works on phones running Android 4.0 version or higher. Android users who have Marshmallow (Android version 6.0) can also use the “Google Now on Tap” feature to take screenshots. It aims at providing contextual information to users from any screen. Users just need to press and hold the Home Button to start it. 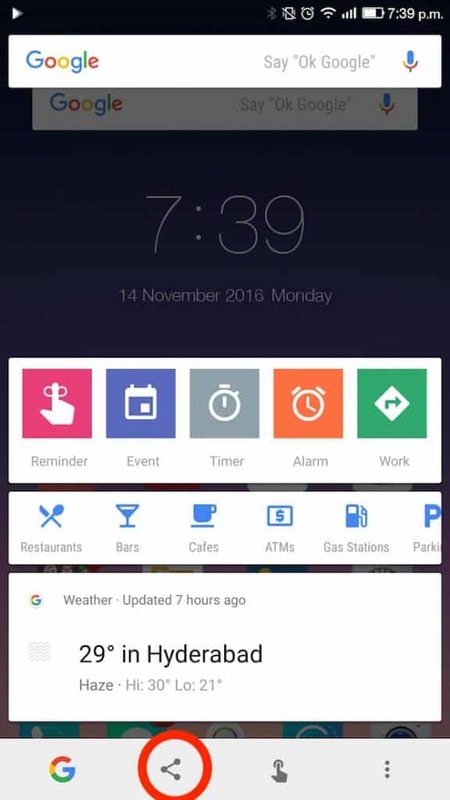 Press and hold the Home button until Google Now on Tap appears on the screen. Tap on the Share button (placed in the bottom left corner) as annotated in the image above. A screenshot will be taken as soon as you tap on the share button. You can share it with the apps given in the share menu. 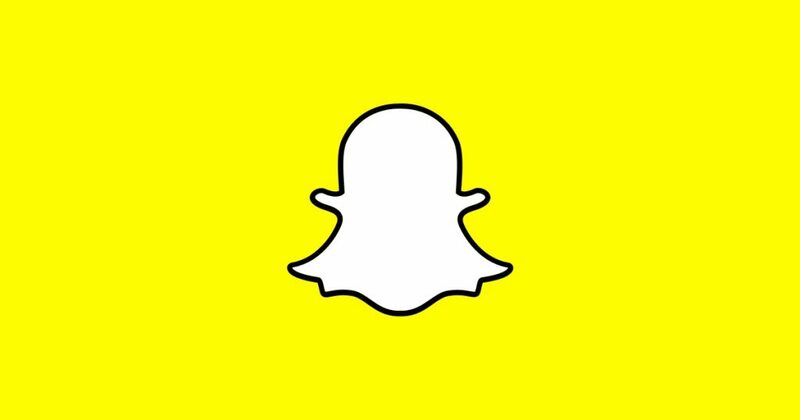 Snapchat is a popular photo-sharing app that lets users send pictures and videos with an expiry time of 10 seconds. Users cannot save the pictures or videos sent to them on Snapchat, but they can take a screenshot of those pictures. To maintain the sender’s privacy inside the app, Snapchat has introduced a new notification functionality that informs the sender whenever a screenshot of their media is taken. However, there is a workaround that enables taking a screenshot without the notification being sent to the sender. Open the Snapchat app on your phone and swipe right to check the latest snaps. Now tap lo load the snap. Quickly switch on the Airplane mode as soon as your snap loads. Take a screenshot by following one of the methods given above. Uninstall the Snapchat app from your phone. Switch off the Airplane mode. Re-install the Snapchat app from the Play Store. By following the above method, the sender will never get a notification about the screenshot taken by you. Taking a screenshot on an Android device can be easier than you think. But some devices use the Home Button and Power Button combination, while some use the Volume Down Key and Power Button combination. So you need to know which combination your device supports. If we forgot your Android model and a different method of taking a screenshot, please share it with us in the comments.